Benjamin, Walter. 2003. The Arcades Project. Translated by Howard Eiland & Kevin McLaughlin. Cambridge, MA: Harvard University Press. Cull, Laura. K. and Lagaay, Alice. 2014. Encounters in Performance Philosophy. London and New York: Palgrave Macmillan. Glendinning, Simon. 2007. In the Name of Phenomenology. Abingdon and New York: Routledge. Grant, Stuart, Jodie McNeilly-Renaudie, and Matthew Wagner. Forthcoming. Performance Phenomenology: To the Thing Itself. Palgrave. Hinden, Michael. 1972. ”Ibsen and Nietzsche: A Reading of The Master Builder.” Modern Drama, 15(4), 403-410. Helland, Frode. 2009. “Ibsen and Nietzsche: The Master Builder.” Ibsen Studies, 9(1), 50-75. Heidegger, Martin. 1962. Being and Time. Translated by John Macquarrie & Edward Robinson. Oxford: Blackwell. — 1971. “...Poetically Man Dwells…”. In Poetry, Language, Thought. New York: Harper & Row, 209-227. — 1978. Basic Writings. Edited by David Farrell Krell. Abingdon: Routledge. Ibsen, Henrik. 1981. Four Major Plays. Translated by James McFarlane and Jens Arup. Oxford: Oxford University Press. Johnston, Brian. 1992. The Ibsen Cycle: The Design of the Plays from Pillars of Society to When We Dead Awaken. University Park, Pa: Pennsylvania State University Press . Johnston, Daniel. 2011a. “Stanislavskian Acting as Phenomenology in Practice.” Journal of Dramatic Theory and Criticism, 26(1), 65-84. — 2011b. 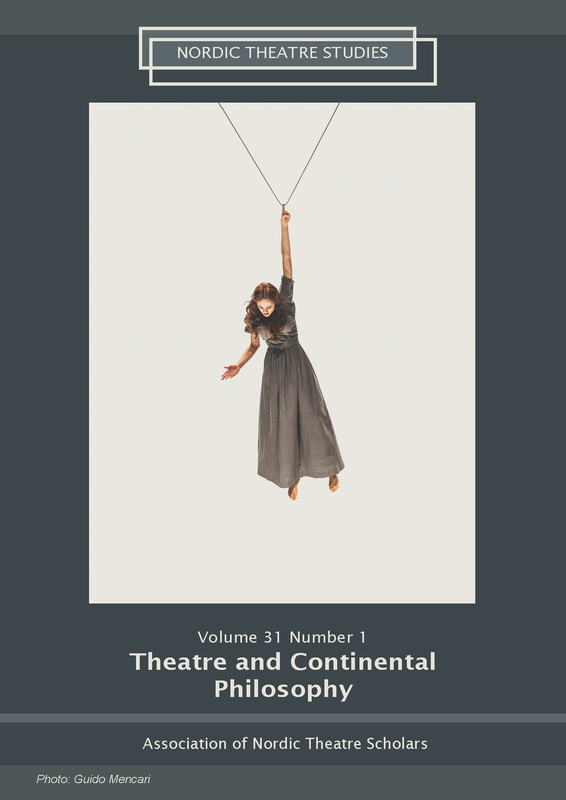 “Theatre-Making as Aletheia: Rehearsal and the Production of Truth.” Theatre Research International, 36(3), 213-227. — 2017a. Theatre and Phenomenology: Manual Philosophy. London: Palgrave. — 2017b. “Ontological Queasiness : Antitheatricality and the History of Being.” About Performance, 14/15, 195-211. — 2018. “Toward A Workshop in Theatre Phenomenology”. PARtake, 2(1), article 7. Kaufman, Michael W. 1972. ”Nietzsche, Georg Brandes, and Ibsen’s ‘Master Builder’” Comparative Drama, 6(3), 169-86. McAuley, Gay. Space in Performance : Making Meaning in the Theatre. Ann Arbor: University of Michigan Press, 1999. Reinelt, Janelle G. and Roach, Joseph R. (eds). 1992. Critical Theory and Performance. Ann Arbor: University of Michigan Press. Schneider, Magnus T. and Skjoldager-Nielsen, Kim. 2012. “Approaching Phenomenology.” Nordic Theatre Studies, 24. Stanislavski, Konstantin, 1949. Building a Character. Translated by Elizabeth Reynolds Hapgood. New York: Theatre Arts Book. — 2008. An Actor’s Work: A Student’s Diary. Translated by Jean Benedetti. London and New York: Routledge, 344. States, Bert. O. 1985. Great Reckonings in Little Rooms: On the Phenomenology of Theater. Berkeley: University of California Press. Thomas, James. 2013. Script Analysis for Actors, Directors, and Designers, Third Edition. Burlington and Oxford: Focal Press. Young, Julian. 2002. Heidegger’s Later Philosophy. Cambridge: Cambridge University Press. — 2004. Heidegger’s Philosophy of Art. Cambridge: Cambridge University Press. — 2006. “The Fourfold”. In Charles Guignon (ed), The Cambridge Companion to Heidegger, Second Edition. Cambridge: Cambridge University Press, 373-392. Wilshire, Bruce. 1982. Role Playing and Identity: The Limits of Theatre as Metaphor. Bloomington: Indiana University Press. Zarrilli, Phillip (ed). 1995. Acting (re)Considered: Theories and Practices. London: Routledge.